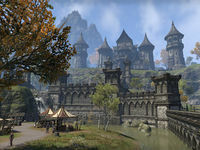 Daggerfall is the largest city in Glenumbra, located at the southwestern end of the peninsula. The city is split into four districts. South of the river lies the Trade District, which houses marketplaces and trade stalls. 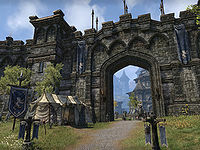 North of the river, the Castle Town contains the city stables, Fighters and Mages Guild halls, the Daggerfall Mill, an inn, and a number of private residences. 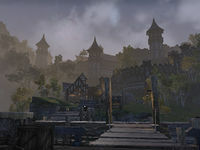 In the northwest lies the Harbor District, where those wishing to visit Stros M'Kai or Betnikh can arrange transport with Gilzir, and Veteran characters can take a ship to Vulkhel Guard or Davon's Watch. To the west sits Castle Daggerfall, home of King Casimir. South of the city lies another dock, where The Spearhead can be found. Daggerfall Objective: Unravel the mystery of Daggerfall. 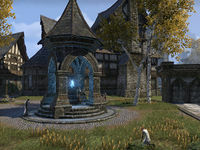 Daggerfall Wayshrine is located in the northern end of Castle Town, behind the inn. This wayshrine is unlocked as soon as you arrive on your alliance's starter island after escaping The Wailing Prison. This page was last modified on 1 April 2019, at 02:04.